In large bowl, beat eggs, half-and-half, granulated sugar, vanilla, almond extract and salt with whisk. Place torn croissants in baking dish; pour egg mixture over top. Push down gently so croissants absorb custard. Let stand 10 minutes, and press again. 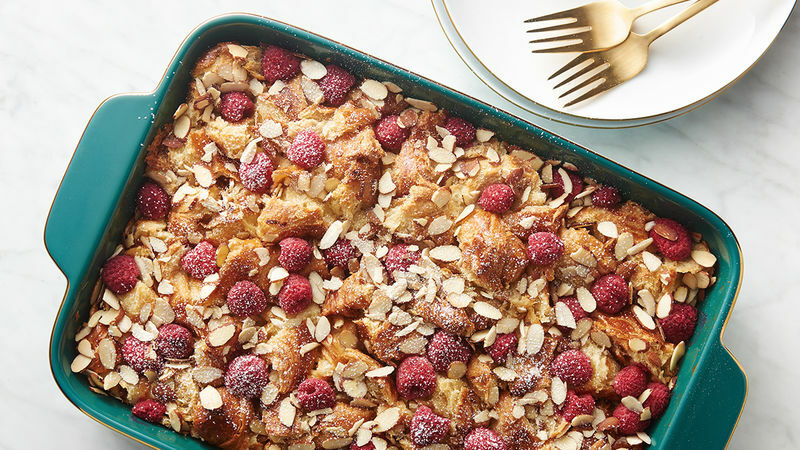 Arrange raspberries on top of croissant mixture. Sprinkle almonds over top. Bake 45 to 55 minutes or until browned and puffy. Let stand 15 minutes. Sprinkle lightly with powdered sugar. Blueberries or blackberries can be substituted for the raspberries in this recipe. Almond extract can be a very strong flavoring -- it takes only a little bit to give this pudding a nice almond flavor.